A summer full of global builds kicked off this week in El Salvador with a group of 26 volunteers–the largest scheduled for The Fuller Center this year. The group, headed by Dianne Fuller, daughter-in-law of Millard and Linda Fuller, made its way to San Luis Talpa, El Salvador on June 20 and will work on building ten houses expected to be finished by the end of the year. The two-bedroom houses will bring indoor plumbing to many residents for the first time. Dianne’s group is made up of members of her church, Highland Hills Baptist Church in Macon, Ga., including her husband Chris and two sons, Ben, 17, and Joshua, 13. Michael Bonderer, the Country Director for the Fuller Center in El Salvador, is leading the team while they’re there. He’s also the founder of Homes From the Heart, the nonprofit that the Fuller Center is working in partnership with. With this project, the Fuller Center focuses largely on building needed homes for an entire community–while also enabling its villagers to flourish on their own. Jim and Margaret Favre serve as Directors of the Global Builders Program for the Fuller Center. They say volunteers often want to revisit a site once they’ve worked on it. 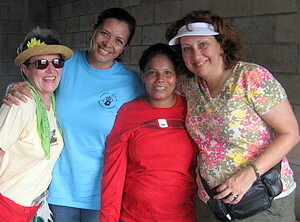 Dianne was motivated to come back after taking part last November in the 2008 Millard and Linda Fuller Blitz Build also in San Luis Talpa, El Salvador. At that time, 16 homes were built by 300 volunteers in one week. The ongoing project is to rebuild the village of Villa Millard and Linda Fuller. Villa Fuller got its name when the community, formerly Villa Santa Clara, voted unanimously in its first council meeting to rename it in honor of the couple who founded the Fuller Center for Housing. Read more about that here. Villa Fuller will feature 60 new homes after Homes from the Heart and the Fuller Center finish their current goals. Homes From the Heart began in 2001 working to build not just homes, but communities. In Villa Fuller, this meant helping villagers find a way to earn a living, through a project called Many Miracles that sets villagers up with a career in sewing. Click here to learn more about the El Salvador project. “It’s a wonderful, wonderful story,” Margaret said of the work being done in Villa Fuller. When there aren’t groups from the U.S. heading to build houses abroad, Salvadorans continue the work on the houses. But the Favres say it’s still important for groups to make the trip. “This is so big that people go there because they bring enthusiasm, they bring prayer, they bring financial support, and they bring hope for the people that are there,” Margaret said. According to Jim, it’s like a big celebration when a group of foreigners show up in rural El Salvador. “We cause a big event, a lot of excitement because it’s the biggest thing to hit the village,” he said. This is the first of 11 summer Global Builders trips including builds in Peru, Armenia and Nigeria. 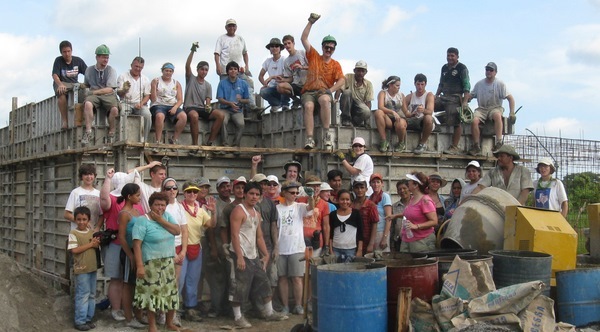 Find out how you can get involved with a Global Builders trip by clicking here. To help build more houses by donating click here.